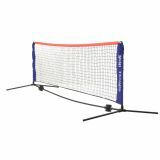 The Champion Sports Mini Tennis Net is great for indoor or outdoor play, and sets up in minutes. Made of lightweight steel, this net folds easily into a handy carrying case for easy storage and transport. Soccer Tennis is a great game to develop overall skill and ball handling while having fun! 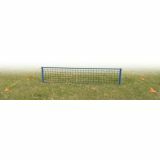 The Soccer Tennis Set is lightweight and easy to set up. The set includes a 10" wide net, two metal poles and guide ropes with anchors for added stability. The Champion Sports Tennis Net Set is a new portable instant tennis match set that allows you to set up a full size court wherever and whenever you need it. The Tennis Net Set is ideal for building skills and backyard fun. This portable net set is quick to set-up and easy to take down. The entire portable system fits easily into a durable nylon carry bag for convenient storage and transport. 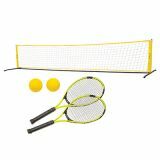 Includes: two 21" rackets, 2 tennis balls & a 12' net kit.